Synopsis: An astronaut is presumed dead after a deadly storm separates him from the rest of his crew. Yet after surviving the storm, he is alone on Mars and must use all the resources he can find to get back to Earth. Review: The thought of being the only person on an alien world, with seemingly no means of getting off, and being one hundred and forty million miles from home, is one that would probably send most people in that situation absolutely bonkers, and give them a complete sense of hopelessness with very little chance of survival, and result in them frittering away the remainder of their days on the Red Planet. However, this is not applicable in the case of Mark Watney, who instead of that aforementioned feeling of impending doom, after he has been abandoned by his crew as he is presumed dead during a deadly storm, opts for one of upbeat and positive. In turn providing an extremely entertaining space adventure that fuses comedy and some intense moments brilliantly. With his fourth entry into the science fiction genre, director Ridley Scott has produced a much needed return to form somewhat after his most recent run of films have been met with a less than positive response, namely Prometheus, Exodus and The Counselor. The likes of Alien and Blade Runner showed that Scott knows the genre and knows how to pull it off in some style, and in what is almost a blend of Gravity and Interstellar produces a third another enthralling space adventure in as many years. Interestingly enough (spoiler alert for Interstellar!) Matt Damon who had a surprise cameo in the aforementioned film is back in a very similar situation to the one he found himself in Interstellar, but this time he is the man we’re rooting for, and he brings charisma and great humour to this role, so much so that you cannot help but want him to succeed and find his way home. With his situation looking increasingly bleak, he has to use his intelligence and his botanist skills to ensure his survival. 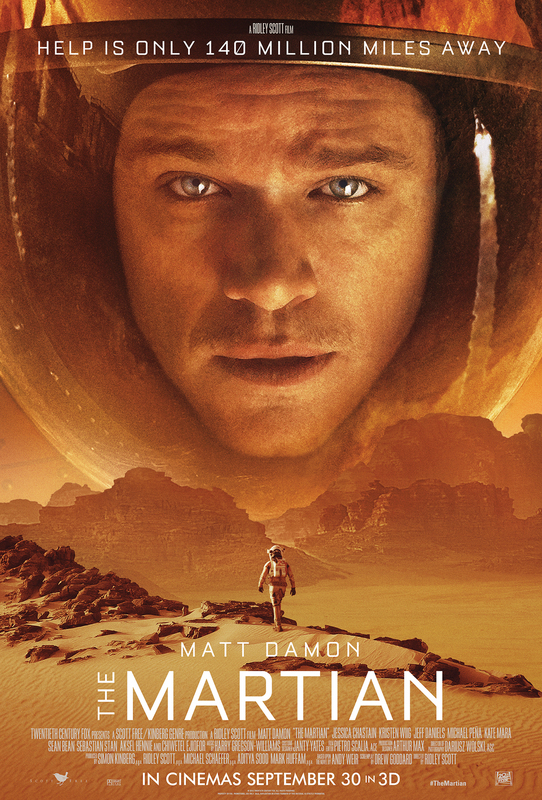 While The Martian battles to stay alive on the Red Planet, the focus alternates between the team at NASA who are working to try and bring him home alive, whilst dealing with the PR disaster that a man was left behind on a hostile world. Whilst at the same time, going back and forth with his crew mates who are solemnly making their way back to Earth, contemplating their supposedly fallen friend’s fate. The cast is quite extensive and filled with some big Hollywood names, with the likes of Jessica Chastain as the captain of the Mars mission, Jeff Daniels as NASA’s CEO, Chiwetel Ejiofor with his expert knowledge of the Red Planet and Sean Bean as a flight director. It’s a big scramble for these guys to get the materials they need to ensure that whatever they can do to get Mark Watney home, they will do it, but not without some bickering and disagreement along the way. It takes some bravery to take a story like this in which one man is almost certainly staring death in the face and make it uniquely entertaining, but this film managed to do it and do it perfectly, thus props must go to screen writer Drew Goddard for that. Matt Damon effortlessly brings his unique brand of humour and charisma to the role, whilst using his ingenuity and remarkable intelligence to try and survive. Yet it is far from sunshine and rainbows all the time, as there are more than a few intense moments where our leading man is put in some more than perilous, potentially fatal situations. The Mars scenery is beautifully recreated and the direction, as is more often than not the case with Scott, is excellent. The score by Harry Gregson-Williams is tremendous and adds plenty of suspense and drama along the way. The film does drag in places and could have maybe been cut down in parts, but nevertheless, it is a pleasure to see Scott truly back on top form and for Damon to once again remind us of his remarkable talent. With a terrific (and large) ensemble cast, filled with the cream of the Hollywood crop, with a superb and humorous lead performance from Damon, to go along with a very witty screenplay, this is Scott’s best picture in some years. We had a similar experience with this film. It’s good to see Ridley Scott getting some recognition again. Personally, I enjoyed Prometheus, but I accept that the wider world felt let down by it. I was seduced by the history and mythology of ‘Alien’, as well as the grand idea that was the backdrop to the story. And like you point out, the visuals were in a league of their own.